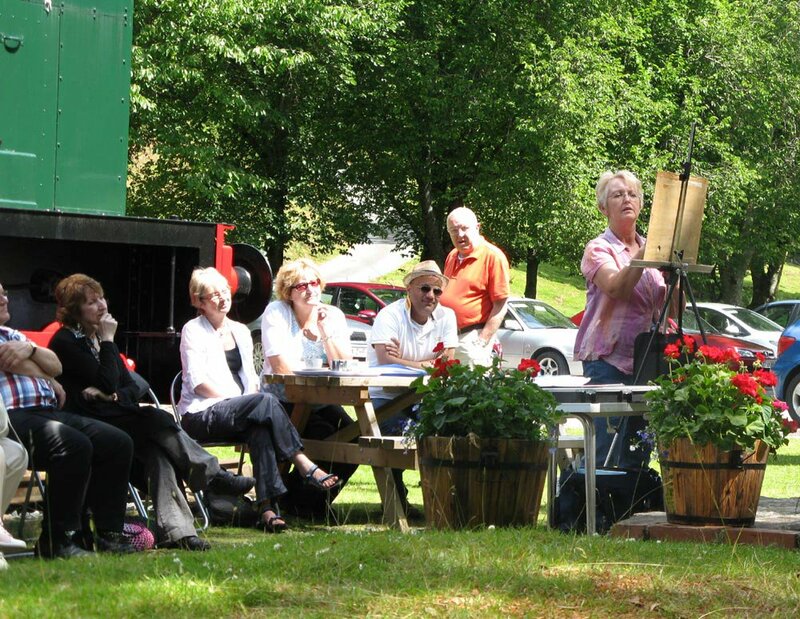 This weekend we had our annual watercolour seminar in Pontypool, and as usual we had a very enthusiastic audience. 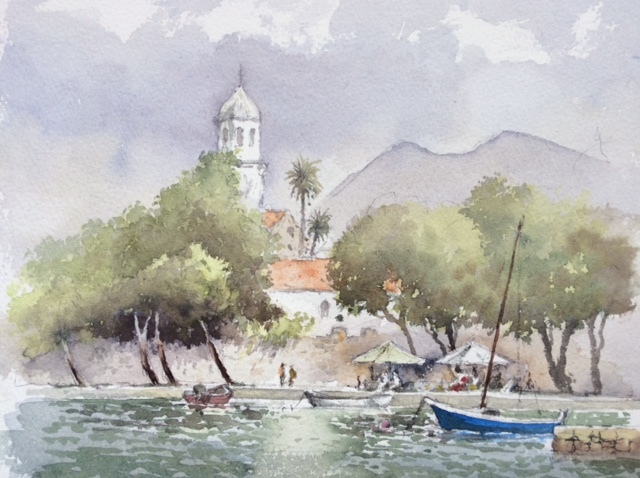 It’s always good when lots of questions are forthcoming and people create a real buzz with their obvious excitement about indulging in watercolour painting and learning new techniques. When they can see the techniques being demonstrated close-up on the screen it really fires them up. One of the techniques I was questioned about this weekend was that of the negative painting method. 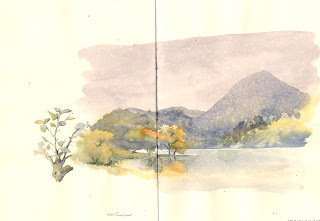 In watercolour, because it is a transparent medium and we cannot effectively paint a light colour over a dark one, we need to resort to other ways of working. 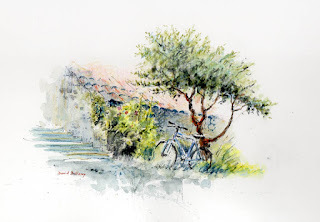 We can use masking fluid, which reserves the white paper, but can be clumsy at times. Another method is to rub a candle across the paper to form a resist, but this is hopeless if you need intricate detail. 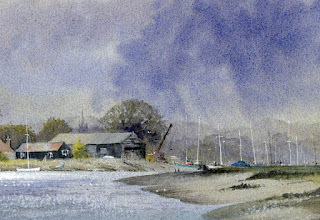 A third technique is to paint gouache or acrylic over the dark area, but here the opaque paint can appear intrusive often losing that lovely sense of watercolour transparency and spontaneity. The picture shows part of a painting mainly completed out of doors. 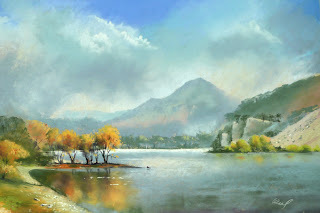 It reveals a number of negative painting examples: the trunk and branches of the birch tree; the right-hand boulder; where the dead bracken stands out against the dark background; and the edges of the falling and turbulent water. The sole method I have used here for each of these examples is to work round each feature with a darker colour. 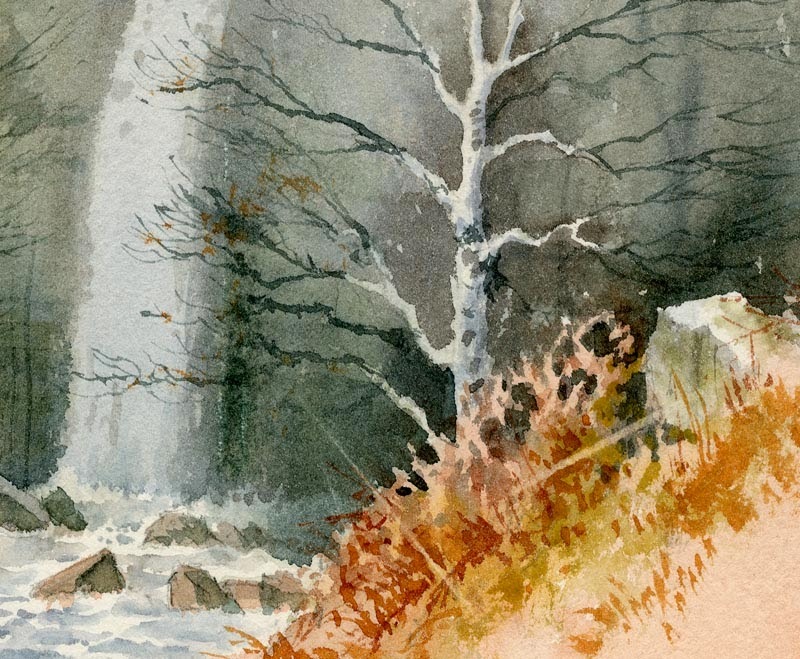 In the case of the red bracken, this was painted on first, allowed to dry, and then the dark background wash brought down to describe the birch tree, the boulder, the water and of course, the red bracken. This techniques is extremely effective and well worth learning. I don’t normally put quite so much negative work into one painting, but this was meant as an illustration on how to apply it, and can be seen on my Painting Winter Landscapes DVD, which accompanies the book with the same title. For more information see my website or that of APV Films who produced the film. August is a busy month this year. I will be doing three demonstrations, two of which are free. 11th August at Erwood Station Craft Centre and Gallery near Builth Wells, as part of the Summer of Great Events. 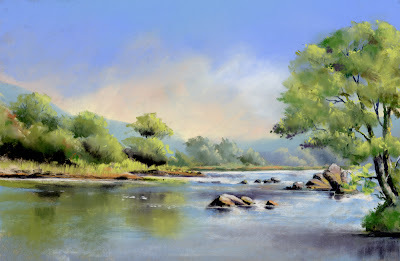 I will be at the station most of the day, demonstrating in pastel and leading a walk to the River Wye to sketch the scene above. This event is free. 17 August at The Sandpiper Studio on the Wirral. An afternoon in Julie McLean’s lovely studio learning how to portray water in pastel. 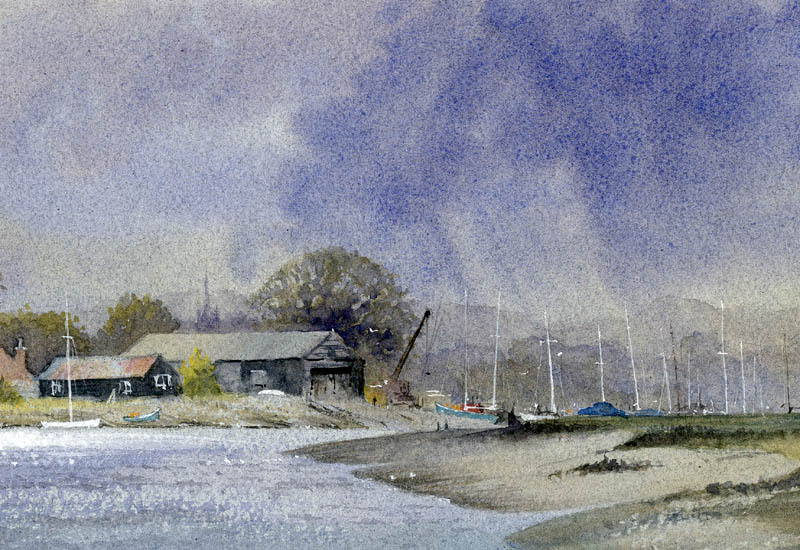 I will be sharing my secrets on how to achieve atmosphere and recession in your landscape paintings. There is a charge for this session. 22 August at Art in the Park in Llandrindod Wells as part of their Victorian Festival. You are invited to come and watch me sketch and paint in the Rock Park and to try your hand at producing your own painting. Materials will be provided. This event is free of charge. If you want to improve your painting, or if you just want to get started, then come along to one of the above events and join in the fun. The painting above was a demonstration at last year’s Summer of Great Events at Erwood Station Craft Centre and Gallery. We had a lovely sunny day last year, let’s hope it is fine again this year. Demonstrating at Erwood Station last year.